The newest critter to appear in our yard here at Sewanee was a red fox, one who slinked through the yard, stealthily approached the bird bath, and surprised a fat robin just before the bird took wing. It was midday, and foxes are nocturnal, so I was surprised that it was hunting during the day. Foxes devour eggs, mice, birds, insects, frogs, lizards, berries, nuts; and this critter had a plethora of things to eat in our yard (and, no, I don’t think they like flowers, so it is one less garden predator – it isn’t among the deer, rabbits, moles, caterpillars, and, lately, slugs who have destroyed four plantings). Actually, foxes have sometimes been used to control pests in fruit orchards, eating the pests and leaving the fruit intact. The critter in my yard was a red fox and looked much like a dog except for its muzzle and bushy tail. It was a solitary hunter, as most of them are, but wasn’t quick enough to catch its bird prey, which told me that it had been hunting most of the night and was just making a last pounce before retiring to the underbrush of our hemlock tree. I felt some trepidation about the critter being in my yard, but fox attacks on humans aren’t common, unless they’re rabid. Some of them will appear on doorsteps, and the Russian Silver Fox can be domesticated. When tamed, the fox loses its musky smell, puts its ears down like a dog and begins to wag its tail to express happiness. Stone carvings of foxes found in eastern Turkey attest to the fact that they’ve been around a long time. My friend Vickie’s mother, who lives in Frostproof, FL, reported that a fox turned up in her backyard, and she instructed the manager of her groves to get rid of it. He brought in a few pieces of sweaty, dirty clothes and placed them over the entrance to the fox’s lair, and Vickie’s mother never saw the critter again. Evidently, they dislike the smell of humans! As I’m a Beatrix Potter fan, I particularly liked her TALE OF MR. TOD (circa 1912) in which Mr. Tod, a sleek, sophisticated fox, is one of the principals; the other major character is Tommy Brock, a bristly badger. The story centers on the kidnapping of the Flopsy Bunnies, and Beatrix wrote the story because she said she was weary of writing “goody-goody books about nice people.” Then there’s the classic Bulrovian fairy tale about Foxy Loxy who leads Chicken Little of “The sky is falling” fame and her band of barnyard animals into his den to eat them when suddenly the sky falls on him. 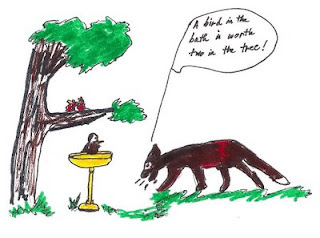 There have been no cataclysmic events since the red fox appeared under the hemlock tree, and some nights when I can’t sleep, I find myself going to the kitchen window and looking out at the bird bath, searching for him. I think it was a male fox, a Reynard, and I’m curious to see it use its bushy tail (referred to as a “sweep”) to change direction quickly. The “sweep” also helps keep the fox’s feet and nose warm when it goes to sleep. I’m told that foxes often cache the food they find, but I’m not brave enough to search for hidden evidence of my fox’s midnight marauding under the hemlock. Also, unlike the British, I’m not interested in taking up the sport of fox hunting. However, I can recall my former father-in-law packing up a half pint of whiskey and a thermos of coffee, two counteractive substances, and going into the woods around Franklinton, Louisiana, in a dilapidated van at night to hear the hounds bay while they chased foxes. He’d return at daybreak, not having seen any foxes but filled with good humor from the sound of his hounds baying and from finishing off the half pint of Jack Daniels that stimulated the fun of the sport. 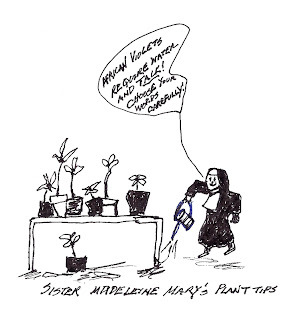 You may think Sister Madeleine Mary has been confined to the convent too long and has become schizophrenic , but she is an expert on plant talk and maintains a healthy respect for a flower that has been cultivated by humans for hundreds of years. As the official caretaker of the African violets, her plants grow well in the light and well-regulated temp of the breakfast room, which has windows on three sides. The violets like tepid water and a room free from drafts… and enjoy stimulating conversation, Sister Madeleine insists. I noticed one wilting plant, and Sister said that she had bloomed too profusely when she overheard visitors to the Convent ridiculing the idea that plants understand human language. Actually, a lot of research continues to be done about plants responding to sound, including wind vibrations that often rasp against the windows of the breakfast room. Music, according to one writer, should be played at 70 decibels, the level of a normal conversation. However, some experts claim that 92 decibels is required, and plants have responded to heavy metal music very well, often growing rapidly after hearing the raucous noises. Sister Madeleine probably plays some of the canticles composed by Hildegard of Bingen, but who knows, she could be a fan of Led Zeppelin! A German professor Gustav Fechner, who wrote SOUL LIFE OF PLANTS, touted the efficacy of conversing with plants and believed that plants do react very well to environmental stimuli – conversation, music, wind sounds...even Prince Charles of England talks to his plants and advocates speaking to them in an encouraging manner. Of course, there’s no scientific evidence that talk helps plants, but lots of botanists believe in this theory. Luther Burbank, the potato grower, believed that plants could understand the meaning of speech through a form of telepathy. The theory is that talking moves the air around a plant and gives out carbon dioxide to aid in rapid transpiration rates the plants needs for growth. However, when you stand close and make sweet noises to your favorite house plants, don’t expect them to answer back. I imagine Sister Madeleine’s African violets respond to the constant prayer resonating in the atmosphere of the Convent, but… I thought I heard strains of an English drinking song just before we entered the breakfast room the other day. Fifty years ago, I stood on the porch of “The Old Kentucky Home” (“Dixieland” in LOOK HOMEWARD ANGEL), the boyhood home of Thomas Wolfe where his mother, Julia Wolfe, kept a boardinghouse until the 40’s and about which Tom wrote in his voluminous novel, LOOK HOMEWARD ANGEL. At the time I stood on the porch, the old home was closed for the week-end, and rain fell steadily as I peered through the glass windows fronting the porch of the yellow frame boardinghouse, wishing I could go inside and roam through the twenty-nine high-ceilinged rooms. Feeling forlorn, I turned away and vowed to come back one day when “The Old Kentucky Home” was open to the public. This past week-end, I entered the restored boardinghouse on a tour guided by an employee with the North Carolina Department of Cultural Resources and got my “literary fix” as we moved through the rooms that Wolfe immortalized, complete with handsome pieces of furniture that once belonged to the Wolfe family. I was able to view the room where his brother Ben died, a large room on the second floor with a bay window and stained glass and the large dining room with numerous tables set with linen cloth and china for over 30 boarders who sought hospitality from Mrs. Wolfe during the early 1900’s. A lot of memories of the old home have been kept alive through Wolfe’s novels, “the spectral images of the people he had loved, who had loved him, whom he had known and lost,” Wolfe wrote in LOOK HOMEWARD ANGEL. Thomas Wolfe was brazenly autobiographical in his writings, and his boyhood in the old boardinghouse at 48 Spruce Street plays a major part in his reminiscences which were so overtly realistic that he could not return to the public library in Asheville for seven years after LOOK HOMEWARD ANGEL appeared in print. Of course, Asheville now lays claim to the famous novelist, and the Thomas Wolfe Memorial is a house museum of which the city proudly boasts. It houses exhibits, an audiovisual program that features Thomas Wolfe’s life, and a gift shop that sells all of Wolfe’s books. I had to purchase at least one of the books and a few postcards featuring rooms in the old home. On the tour I learned that LOOK HOMEWARD ANGEL has never gone out of print since its publication in 1929. I remember reading it in the late 50’s and being taken with the poetic prose and Wolfe’s abilities as a commentator about social ills, particularly those in the South. I bought YOU CAN’T GO HOME AGAIN because I wanted to read about the censure that surrounded Wolfe when he went home to Asheville after seven years. It’s reported that Ella Winter, a guest at a dinner party in New York City that Wolfe attended, provided Wolfe with the title for this book. When she learned that Wolfe had returned to Asheville after his seven year absence, she said, “But don’t you know you can’t go home again?” Wolfe’s way of returning home was to write about that experience. That message of optimism was written in 1937-38, and I wonder what Thomas Wolfe would say about those nations today? Yesterday, I celebrated my 74th, and among the flurry of telephone calls and e-mails wishing me well was a call from my grandson Martin who was born on my birthday 30 years ago. At 7:30 a.m. Martin called and we exchanged birthday greetings. He’s a half year into his marriage and recently bought a new home in Madisonville, Louisiana where he practices as a landscape architect, and his cheerful voice buoyed me the rest of the day when I could have been lamenting the fact that I was almost halfway through my seventh decade. 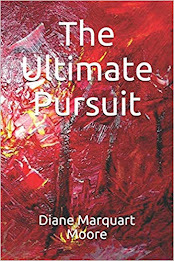 Many of the covers of my books bear the illustrative marks of my brother Paul and the design work of Martin. One of my children’s books, THE CAJUN EXPRESS, was illustrated entirely by Martin, and he began work on it shortly after he celebrated his tenth birthday. The story is about an abandoned London red bus that an unknown person transported across the ocean from England and parked in a pasture near Opelousas, Louisiana. We had passed the bus many times while collecting plants with Martin’s godmother, Vickie, and it looked so forlorn that Martin and I decided to showcase it in a book. Actually, Martin has traveled throughout the U.S., Canada, and Mexico with me and his godmother from the age of two and has spent a lot of time in the back seat of a van, drawing and sleeping through the more exotic landscapes. I suppose he saw enough landscape to foster an abiding interest in landscape design, but he was often so bored that he resorted to drawing pictures of his Rebok shoes while traveling through long stretches in the West. During the time Martin was growing up, his mother attended ULL in Lafayette daily, and I was frequently called when emergencies occurred, one of those emergencies being the day that he ran into a tree and battered his mouth so badly that I had to rush him to the emergency room. 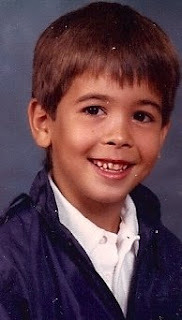 Yesterday, while going through old photographs, I unearthed several pictures of Martin taken when he was in kindergarten and grade school. The photo I chose to place on this blog shows a face that is not disfigured and teeth that are fairly straight, but you can judge from the following poem in one of my chapbooks that his run-on encounter with a tree could have caused serious damage to his young face. him whirling around the world. that he was hypermagically swift. no longer lulled by their quiet swish. Yesterday, during 7 a.m. Morning Prayer and Eucharist at St. Mary’s, we began to recite the “Song of Creation” (“Benedicite, omnia opera Domini”), chanting “Glorify the Lord, you angels and all powers of the Lord,/O heavens and all waters above the heavens./Sun and moon and stars of the sky, glorify the Lord,/praise him and highly exalt him forever…” and a vivid image of my mother appeared in my mind. The image stayed on the screen of my consciousness for quite awhile, and the rest of the recitation was lost as I envisioned her walking with my young brother, Harold Jr., on a grassy path, loaded with cacti, high above Buchanan Dam near Burnet, Texas. At the time, she was in her thirties, and we were encamped during a trip to the Great Wild West, or to Diddy Wah Diddy, as my father called California. I remember that she was dressed in blue jeans and a khaki pullover shirt my father had bought her for the trip, and the look on her face expressed complete freedom and happiness. The vision was a nice one and reminded me that I had done nothing in her honor on Mother’s Day – she died in 1978 at the early age of 69, not so free and happy. Well, I thought, I’m two days late remembering my mother in some way, but she must have looked down and thought I needed to commemorate her as I recited the “Song of Creation.” Following services, good friends from Texas came to visit and over lunch at an Italian restaurant in Winchester, TN, we talked about many of our mutual friends, but the face of my mother kept appearing in my thoughts as we conversed. At bedtime I finally remembered her properly in the Prayers for the People, especially those who had departed. I’ve published some of the introduction regarding Dorothy Greenlaw Marquart in my book, THEIR ADVENTUROUS WILL, PROFILES OF MEMORABLE LOUISIANA WOMEN (now out of print) in a former blog but didn’t include those passages that pertained to her love of nature and the “sun and moon and stars,” as well as “drops of dew and flakes of snow…” “O mountains and hills,/and all that grows upon the earth…”( more passages from Canticle 12 often recited during Morning Prayer). Well, there’s the song and the epitaph. And Happy Mother’s Day, Dorothy! 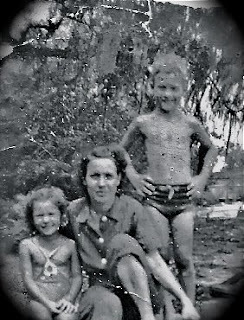 Note: The photograph is of Mother, my older brother Paul, and me, after Mother took us for a swim in the lake at Lake Arthur, LA. While eating breakfast at the small table on the front porch this morning, enjoying 68 degrees temps and the prelude to morning rain, I spied two trees in our woods, perhaps two feet apart, long trunks bent at the same level and facing in the same direction. The trees, now leafed out in a brilliant lime-green hue, resemble long human legs with bent knees and set me to thinking about how much we attribute human and animal characteristics to trees and flowers – in forms, faces, and expressions. I remember the story my grandmother once told about my love of flowers when I was just beginning to talk. She planted a great round bed of pansies in the front yard yearly, and when we walked to inspect her flowers, a twice-a-day event, I always ran to the bed, bent down and buried my face in the flowers, exclaiming, “Puppy dog faces.” If you haven’t considered the similarity between this flower and a canine face, gaze at the soft-faced pansy sometime and see if you can visualize the resemblance. My youngest daughter, Elizabeth, sent me 15 red roses for Mothers’ Day, and I know that the delicate shape and color of the blooms signify human expressions of love at its fullest. Clumps of Dianthus bordering my back walk remind me that my father planted them every year because the flowers bore a resemblance to his daughter’s name and he attributed similarities in appearance. Here at Sewanee, cultivated flowers flourish, but wild vegetation also abounds. There are areas on The Mountain where walking, birding, and hiking take place in the dense vegetation of abundant woods and where numerous thickets of pine, oak, sourwood, hemlock, redbud, dogwood, and rhododendron “congregate” and enthrall nature lovers. According to Russ Manning, settlers heading west across the Cumberland Plateau caught glimpses of crab apple trees blooming in grand profusion at the western foot of the mountains that are on the eastern edge of the Plateau. The mountains were called “Crab Orchard,” and the crab apple orchards provided a rest stop for travelers heading west. A large two story inn, “The Crab Orchard Inn” was built on a small knoll but was later torn down. Many of the old trails on the Cumberland Plateau were once Cherokee trails, and most of the Plateau was once owned by the Cherokees. Backpackers and serious hikers constantly explore the Cumberland Plateau to experience its natural beauty, sometimes moving from Tennessee to parts of Kentucky, Alabama, and Georgia, seeking protected areas. Well, this vignette began on an anthropomorphic subject and seems to have finished on a note of nature exploration… inspired by breakfast on the porch. The above photograph of the two bent-knee trees may arouse your curiosity about this idea of vegetation/human forms. Not a mile from the turn-off to Death Valley. Thunderstorms, heavy rain, and tornado alerts prevail on The Mountain this morning and create a lot of indoor time for introspection. While the rain pelts steadily and dogwood blooms fall to the ground in a stream of white snow, I think about the impending occasion of Mothers’ Day. I know that it’s a day when I’ll be remembered with flowers, large cards with wonderful sentiments written on them, and a gracious plenty of B&N gift cards so I can buy books without chiding myself for spending money on this luxury. However, I wish that the Mothers’ Day observance would be changed to Mothers/Daughters’ Day because I always feel as though I should send them blooms, cards, cookbooks (which my youngest daughter loves), and other remembrances to let them know how special they are and how they occupy such a large part of my heart. This morning, I leafed through a manuscript (unpublished) entitled RESURRECTION OF THE WORD and found a lot of “daughter poems,” one of which appears below, and memories took over the time I usually devote to writing. 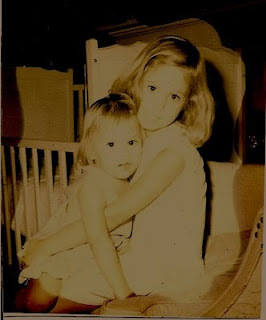 I think about the strongest quality I love and respect in both daughters and thank God that both of them have a sensitivity to the needs of others and are empathetic women. Both are caretakers; one by profession (social work) and the other through extended motherhood when she surprised all of us by having another child after her two oldest children were grown. Although both suffer, at times, from their heightened sensitivity, I’m glad that they aren’t as narcissistic as many women their age seem to be nowadays. Neither of them have houses with study walls bearing numerous degrees or jobs in which they have achieved corporate leadership, but both contribute a lot toward nurturing and empowering humans. already certain of a happy life with you. all alone, the house afire. and checked her progress all morning. Would she miraculously renew her own body? made her a new home in a silver spoon. Since that time I’ve learned a lot about ladybugs -- how they symbolize good luck and are the state insects of Tennessee where I currently live. The Turks refer to ladybugs as lucky bugs, and the French call them “beta a bon Dieu,” or “The Good Lord’s Animal,” and in Russia, the ladybug is sometimes called “Little Messiah.” I didn’t know any of this wonderful lore when I wrote about Fr. John, and the readings move me to ponder the synchronicity of the universe.